When is a bridge not a bridge? The answer according to one nonprofit organization is: when it’s an exhibition space for emerging art. A timely example is a Kingston bridge that has been transformed into a canvas for two local artists. Artbridge: Kingston is a curated public art installation in Kingston, NY featuring original works by emerging Hudson Valley artists. ArtBridge, a New York City-based nonprofit organization, is best known for transforming disused urban spaces into large-scale canvases for emerging artists. Through billboard-sized public art installations, exhibitions in its gallery, and educational programming, the nonprofit looks for innovative ways to create opportunities for artists — and to connect the public to their art. The organization is the brainchild of Rodney Durso, an adjunct professor at the School of Design Strategies, Parsons School of Design. He came up with the idea when the building he lived in was covered in construction scaffolding for almost three years. As a painter, with a background in graphic design, the scaffolding seemed like a great opportunity for artists to have their work shown in a new way. And Durso also knew there were many emerging artists eager for gallery space. He decided that such urban vistas might supply such exhibition space, so he approached his building’s owner with the idea of using the scaffolding to showcase new work. The owner agreed and a bridge was created between available space and emerging art. It was important to Durso that artists chosen for such projects were unrepresented artists, early in their career, who had not had gallery exposure. The result of his efforts can be described as a win-win situation. The artists enjoy unprecedented exposure and the art brightens the urban landscape. After its first five successful years in New York City, the organization was open to expansion. When branching out, several locations were considered, including Chicago and San Francisco, even cities in Italy, but the city chosen was Kingston, New York. 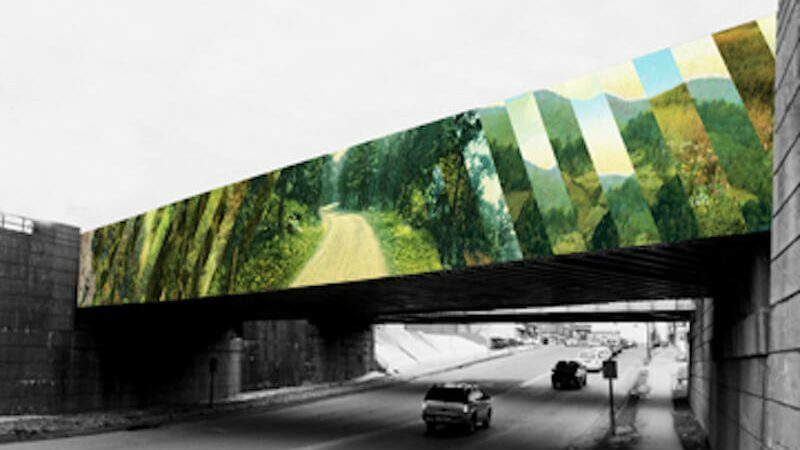 Partnering with the City of Kingston, the organization invited Mid-Hudson Valley-based artists to submit works for a large-scale, public exhibition on the Greenkill Avenue Bridge. Raleigh Green, who recently moved to the area, initially promoted the idea for the Kingston initiative. The marketing and branding expert learned of ArtBridge while living in New York City and saw the Greenkill Bridge as the perfect site to bring the initiative north, while celebrating local talent. “Kingston’s creative community is tremendous,” said Green. “It’s an asset that should be showcased as much as possible to bring positive attention to this wonderful town and region. Although the organization was expanding to a new location, it was important that the focus remain on local artists and that the work be judged by local panelists. Area artists were invited to submit their work. While no particular style or medium of art was ruled out, the winning pieces would have to enhance the space and be visually pleasing. The final selection was made in February. Having narrowed down the submissions to ten finalists, two Ulster-County artists were ultimately chosen, Emily Gui of Rosendale and Lomontville-based multimedia artist, Adie Russell. Gui’s selected work, “Moon Phases,” employs the cyanotype, a pre-digital camera-less photography technique, to depict the universally recognized symbol of the moon and suggest the passage of time. As a painter and printmaker, Gui enjoys working in cyanotype because she can easily make prints with objects, negatives or drawings on almost all types of paper and fabric. While working on this piece, she kept a public audience in mind. For Gui, what is unique about public artwork is that it catches viewers who are not necessarily expecting to encounter art in their day. Russell’s digital composite of old vintage postcards situates drivers traveling west on an infinitely expansive alternate road. It alludes to the adventure and mythology of westward travel that the artist says she hopes will inspire “feelings of possibility and hopefulness” in those who pass by. As a painter and writer, most of Russell’s ideas come out of language. Providing art that can be seen in a public context requires putting yourself in the place of the potential viewer. The artists’ work will be photographed and printed on vinyl or a similar material and will not be attached to but hung from the bridge. In the fall, the exhibition material will be taken down and made into tote bags. The exhibit unveiling is timed for the Kingston’s St. Patrick’s Day parade, on Sunday, March 10. On March 15, beginning at 7 p.m., ArtBridge invites exhibiting artists and area residents to celebrate the exhibit at Seven21 Media Center. There, original works by the ten finalists will be on display and for sale, along with limited edition exhibition posters featuring Gui and Adie Russell’s selected works. Guests will also have the opportunity to bid on one-of-a-kind tote bags made from the exhibition material. Proceeds from all sales will go to ArtBridge and the participating artists, to make it possible for them to continue their work. “It’s an all around re-use project,” said McKenna. “We reuse the spaces and will re-use the art. So the next time you pass a bridge, know that it is potentially more than a bridge, but a possible art venue. For questions about ArtBridge: Kingston or selected artists, contact Director, Jordana Zeldin at: jordana@art-bridge.org or Raleigh Green at raleigh@art-bridge.org.